A home motorbike project's home on the web. Ride out’s, Rallys, Shows and Racedays. Stock exhaust has got to go.. Loud pipes save lives after all. I am, as it happens a believer in the mantra that loud pipes save lives. 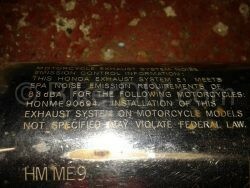 But that aside, I had no real choice when it came to the exhaust system on the shadow. 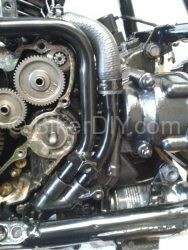 The stock exhaust system was all there on the bike when it arrived, such as it was. 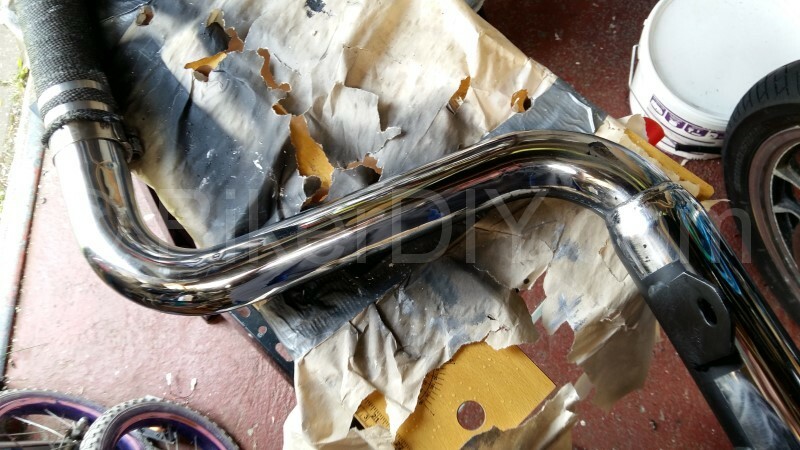 The once all shiny chrome finished headers and heat shielded pipes where still there. 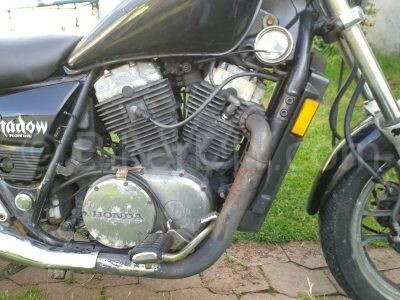 There but by the grace of Mr Honda’s quality of materials and in some part the now almost gone layer of matt black something that someone applied post chrome. And there where holes to be heard in the thing. 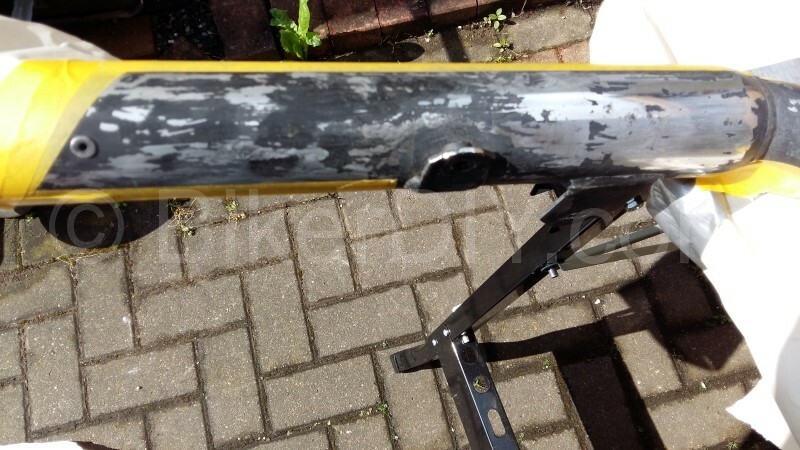 And holes to be seen once it was opened up and removed from the bike. 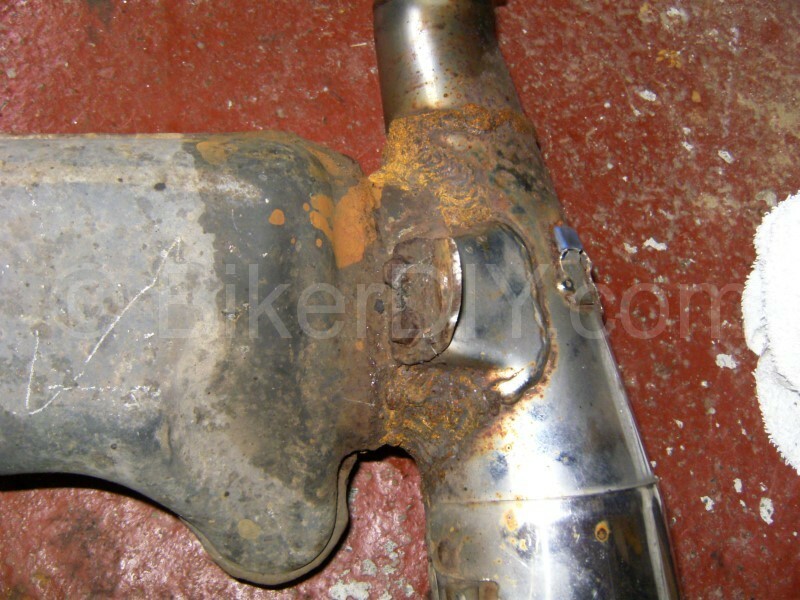 Funnily (to non engineering me at least) the muffler itself in the centre seemed to be in good condition. 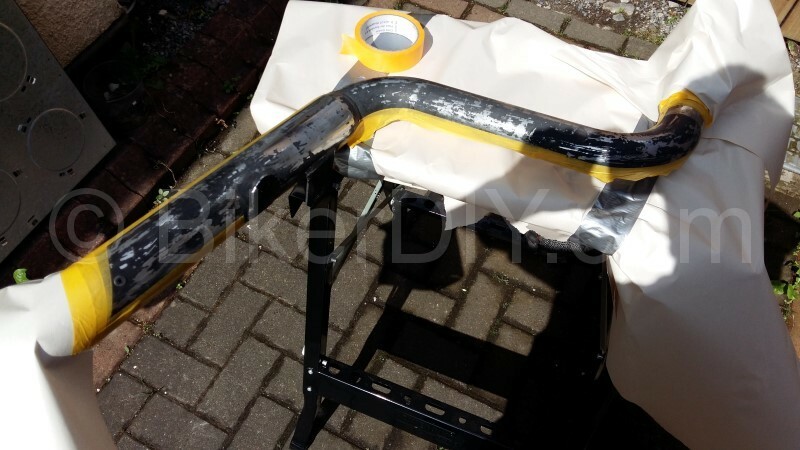 It was the joint sections where it met the exhaust pipes that looked really rather ugly at this stage. 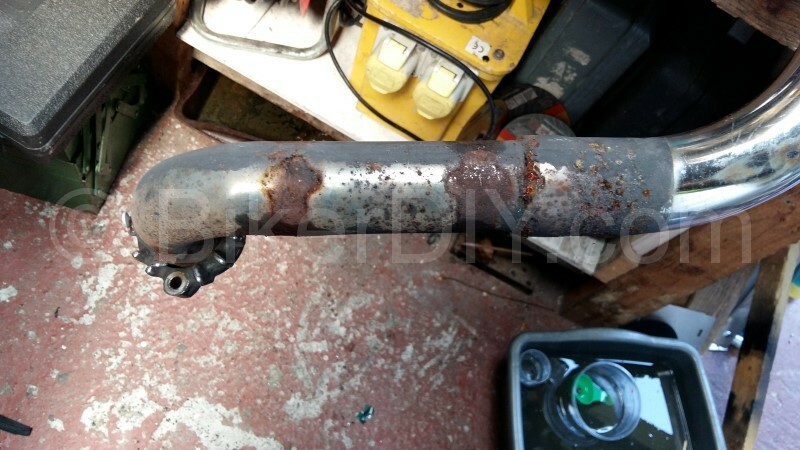 In this bikes past someone had waged war on the exhaust pipe rust and had sacrificed many many filler rods to the cause. 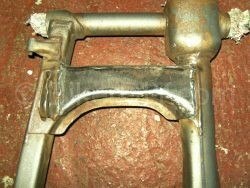 There where layers of weld runs on the left and right of the muffler section. So all the “repairs”, the dents and the general poor state of the remaining chrome lead me to decide quite quickly that the stock system was out and a replacement would have to be found. However according to one supplier, if I could even get a new exhaust, the back muffler alone would be over €1000 and €300 or so for each of header pipes so that was another easy decision to make. And if I’m honest I didn’t see it as a loss, as the stock exhaust was so very very 80’s looking. 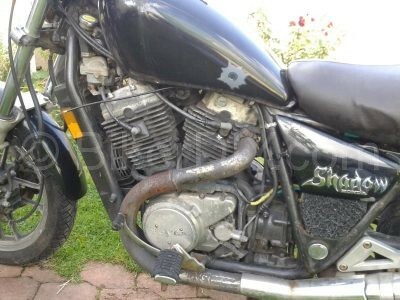 Luckily Donedeal lead me to somewhere not too far away, where a gent was breaking an 80’s VT750c whose knackered engine had a custom exhaust pipe set on it. This I got from him along with a couple of other bits for small enough money. 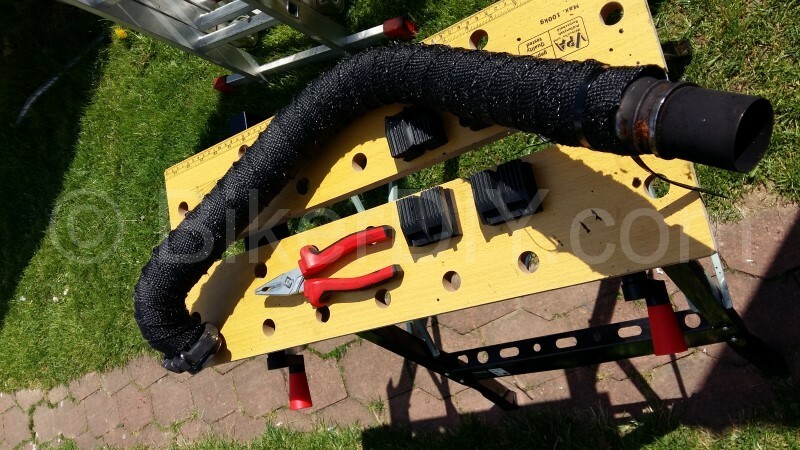 The new set was also a little used cosmetically but not near as bad physically as the original pipes. 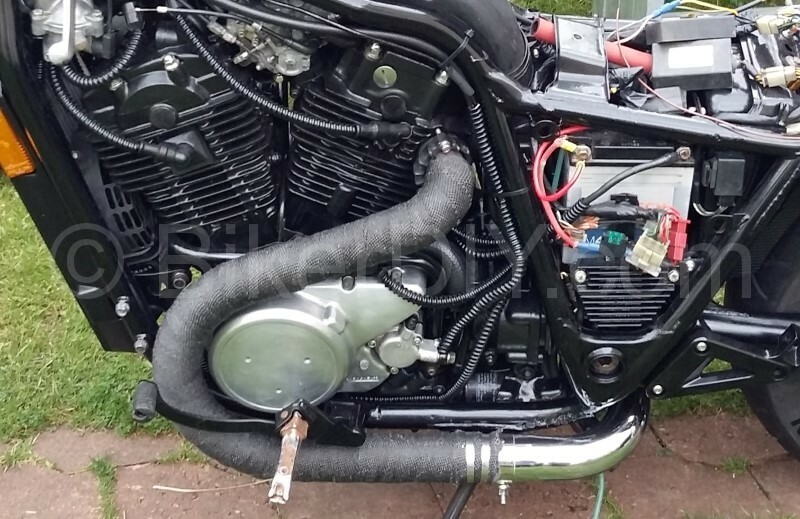 The front bits were a little pitted where the heat shield brackets gripped..
and the underside of the back bits were a little scuffed but there was potential, and they were a much better suited design being over and under down the one side of the bike and virtually straight through. 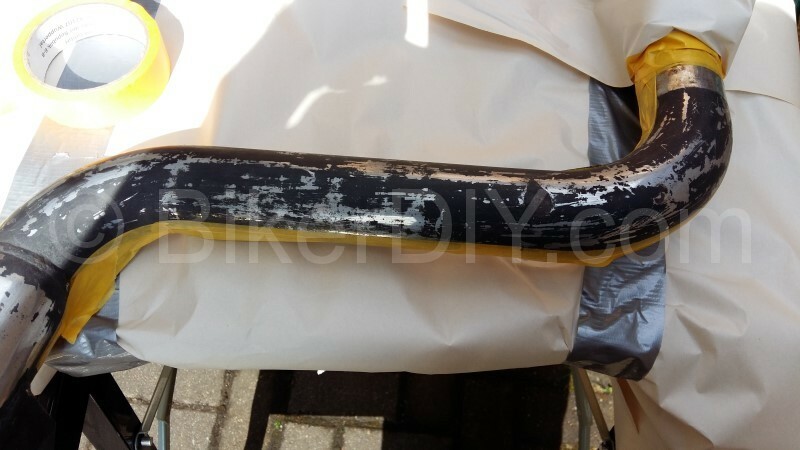 So I elected to cover the headers in black exhaust heat tape to keep with the black look for the bike and it is also a most effective way to cover extreme temperature changing pipes that will last longer than any paint coating I know of and can be reapplied easily enough if it doesn’t. This isn’t at all a hard a job to do once you set yourself up with room and access to the piece from all around. I used a wrap bought online for around €20 for a 15metre lenght which came with 6 stainless straps as well. I would definitely say after using it that it should be put in a bucket of water before hand, and do wear gloves you dont mind dyeing black as the fibers can really itch. Also you need space you don’t mind blackened water being splashed about a bit in. You might like to know that it took about 11meters of 50mm wide wrap to do these two headers with the slightly less than half the width overlap you can see in the pictures above. 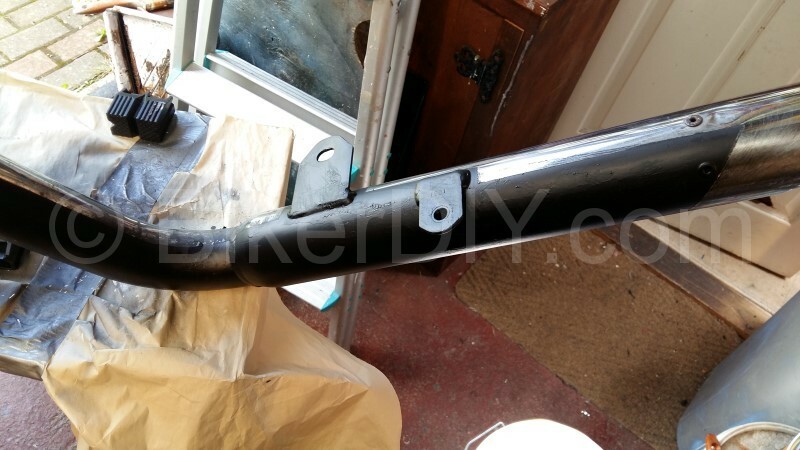 As for the back sections of the exhausts, well the chrome on these was good save for the want of some polishing and someone had applied what I guess was some sort of stove black paint to the underside as protection/cover of stone chips and scuffs. So I thought that while it would be a rather large deviation from the all black look, the pipes would probably work out best if I re coated the underside in black again (hence the masking off in the pic above), and gave the rest of the chrome a good polishing then it would go from this..
And when fitted to the bike they looked like this..
And they sounded like this. I am well pleased with the result (although my audio recording doesn’t do justice) and the Shadow is one step closer to being on the road. 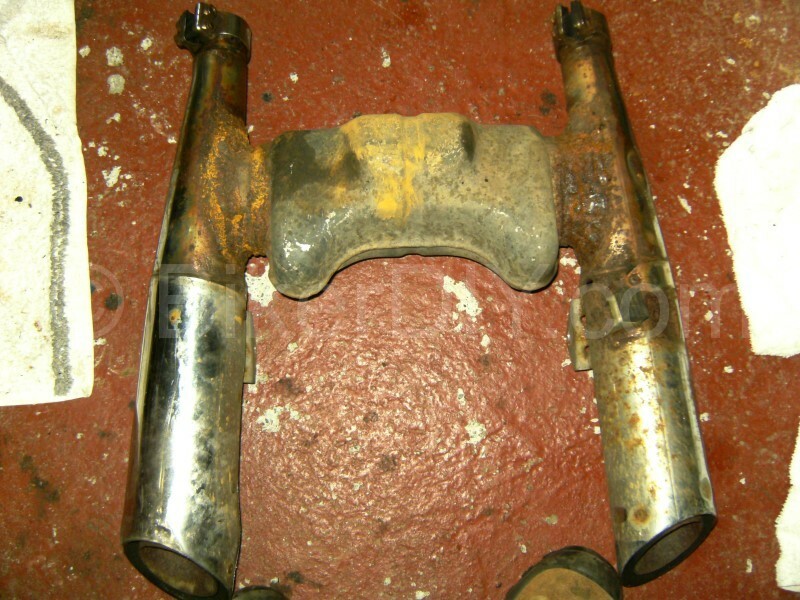 Exhaust overhaul – the end can. 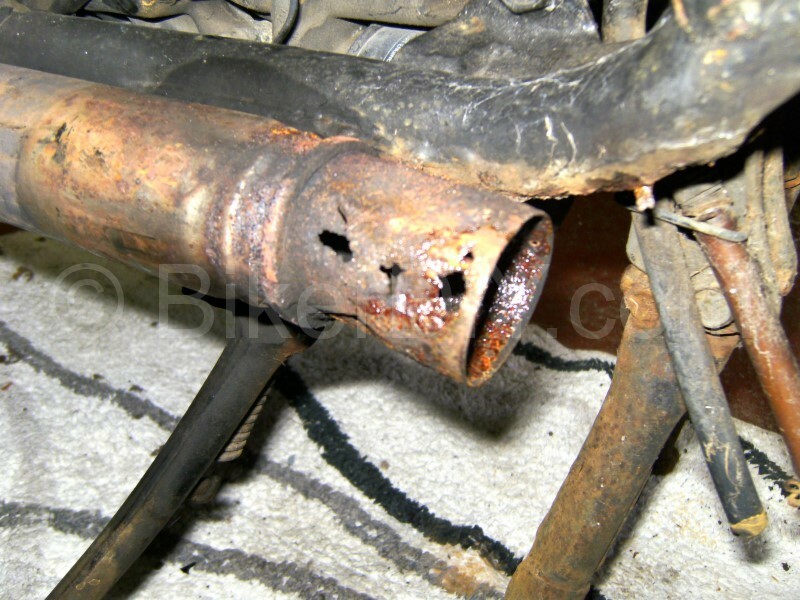 Things I learned the hard way…coolant tank pipes. The bike and the back story. 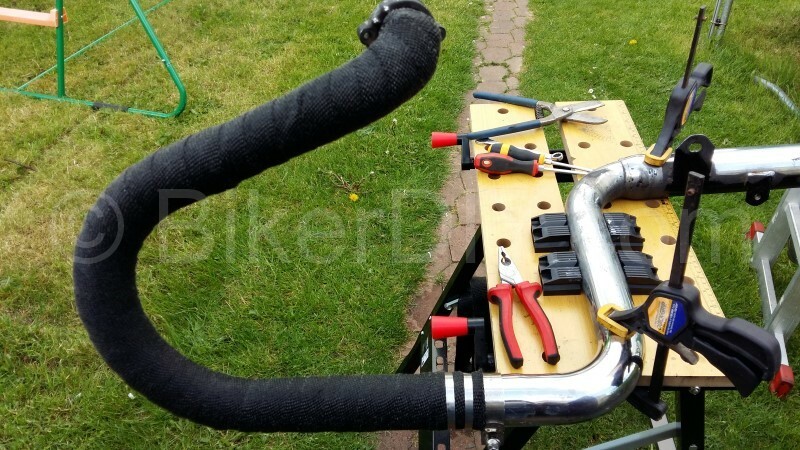 Supplier's worth a BikerDIY.com mention.